Question: What's your favourite aspects about working on Laoconnection.com? (1) It's a creative outlet for me through writing and doing graphic design. (2) Knowing that others appreciate and visit is very rewarding. (3) Working on the site is certainly an impetus for me to continually learn new things about Lao culture, although I've already been doing that before the blog. 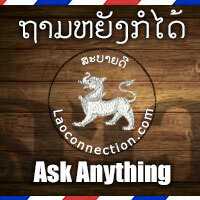 I admit, I can't get enough of learning about Lao culture. I love it and have a strong desire to share information about it. I hope people enjoy it too.